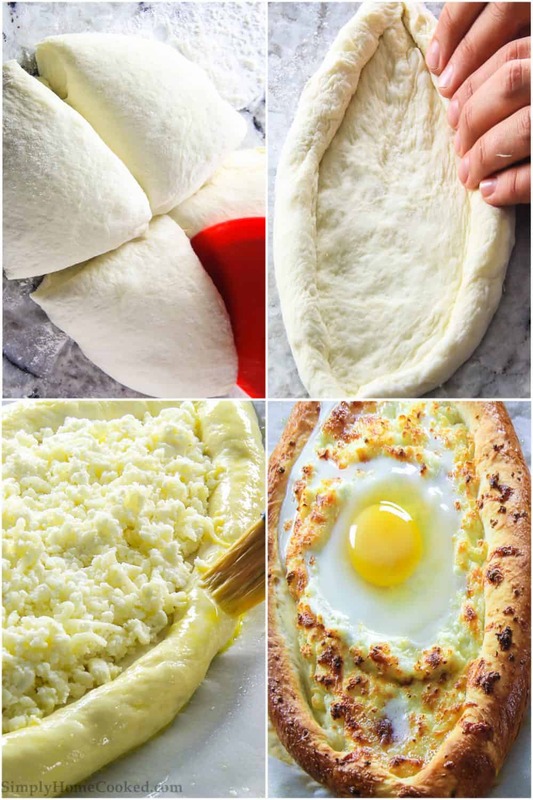 This Khachapuri recipe is a combination of fluffy homemade bread, multiple kinds of cheeses and a runny egg in the center. It’s so cheesy and delicious! This Georgian staple food is a great side dish for dinner or even a delicious brunch idea. We love to serve it along with other Georgian food like chakhokhbili– an herbed chicken stew. This recipe was originally posted on Jul 23, 2015, we’ve tweaked it a bit since then. Combine flour, salt, yeast, and sugar in a bowl. Then add warm milk. Using the hook attachment, knead the dough until it takes shape. Then add oil and knead some more. Place the dough in a greased bowl. Cover and let it double in size. Remove from bowl and divide the dough into 4 boat-shaped pieces. Place the bread boast on a baking sheet lined with parchment. Combine the three kinds of cheese and fill each bread boat. Using a pastry brush, brush with egg wash and bake for 15 minutes at 450 degrees Fahrenheit. Pull the khachapuri out of the oven, then make a well in the middle. Drop the egg in the center, add pieces of butter to the melted cheese, and bake for another 5-6 minutes. This Khachapuri recipe is also known as Georgian Cheese Bread. Khachapuri is a warm boat-shaped yeast bread stuffed with multiple different kinds of cheese and an egg in the center. There are many variations of Georgian cheese bread that depend on the region and cook. This boat-shaped kind is called khachapuri adjaruli. Can I make Khachapuri dough ahead of time? Yes, mix the dough, then cover with plastic wrap and refrigerate overnight. It should rise overnight. Cut it into 4 equal pieces, shape it into boats and let it rise in a warm place for about 20-30 minutes. Then fill with the cheese mixture and bake. 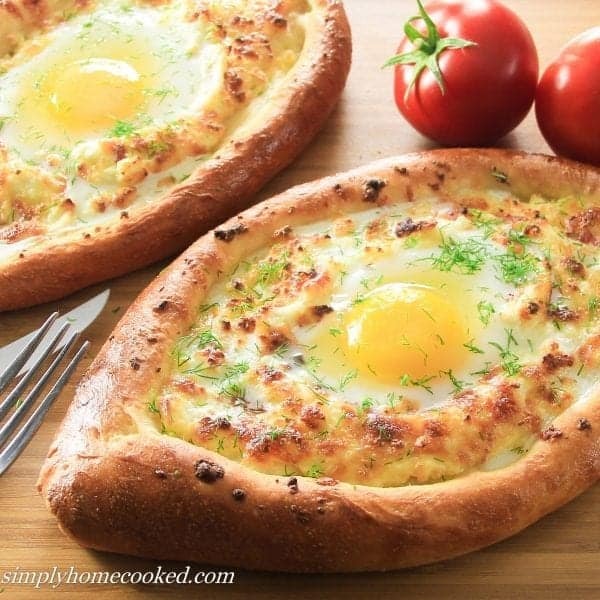 This Khachapuri recipe is a combination of fluffy homemade bread, multiple kinds of cheeses and a runny egg in the center. It's so cheesy and delicious! salt, yeast, sugar, and flour. Heat water and milk to about 115 degrees Fahrenheit. Then pour it into the bowl of dry ingredients. Begin kneading the dough with the hook attachment until it's close to being smooth and elastic. Add the oil into the dough and knead for another minute. Drizzle a little bit of olive oil onto the bottom and sides of a deep bowl. Place the dough inside the bowl and cover with plastic wrap. Set the bowl in a warm place until the dough doubles in size, about 1 hour. Remove the plastic wrap and press into the dough a few times with your hands. Cover with plastic wrap once more and let it sit in a warm place for another 30 minutes. 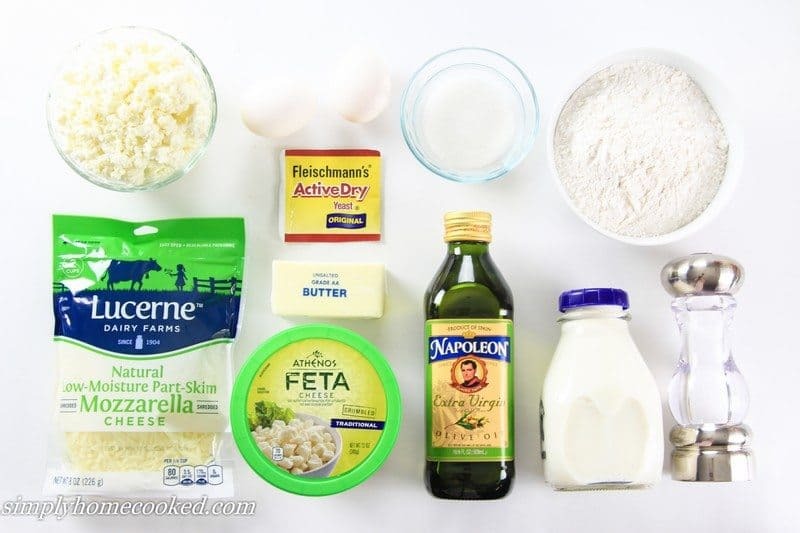 Meanwhile, combine the farmers cheese, feta, and mozzarella in a bowl. Remove the dough from the bowl and place it onto a floured surface. Then cut it into 4 equal pieces. Spread each piece of the dough into a circle about 9 inches in diameter. Then roll 2 opposite sides of the circle towards the center so it ends up have a boat like shape. Then pinch the corners together. Transfer the khachapuri onto a baking sheet lined with greased parchment paper. Stuff each khachapuri with the cheese mixture. Beat 1 egg with a teaspoon of water, then brush the dough with egg wash.
Bake in a preheated 450 degrees oven for about 15 minutes or until the crust becomes golden brown. Make a well in the center of each khachapuri with the back of a spoon (about 3 inches in diameter) and drop 1 egg into each well. Then stick a few small pieces of butter into the cheese. Return the khachapuri back into the oven and bake for another 5-6 minutes. Cooking time may vary depending on your oven. The egg white should be white but still pretty runny. It will cook further as it sits in the hot cheese. When serving, mix the cheese and egg with a fork and serve immediately. ps: We’ve update some the photos in this recipe, here are the old photos. came out perfectly, and I don’t even have a stand mixer. absolutely delicious and surprisingly easy, a firm favourite in my flat & we’ll be making it again! Made this last night and it was AMAZING! Used your recipe but while looking at others, found a comment from a Georgian who uses El Viajero Queso Blanco Fresh Snacking Cheese which she says is the closest to what they use in Georgia. Got it at Wegmans but Walmart also has it. Delish! Thanks for a great post!! Thank you for the awesome feedback Wrybread! I would look for that cheese next time I make this khachapuri recipe! Hi, There are typos in your contact profile. Instagram: I found you at SimplyHOMECooked, but you’re profile says SimplyHOEMCooked. Thanks for catching that Skye, I will fix it. Wow so delicious! We do a food from a different, randomly selected country every month. This month it was Russia, and it came up in a Russian food search. So that just turned this into a history/ culture lesson. I only made one with the egg to be traditional. My son thought it looked gross and I am iffy with eggs. He didn’t love the egg one, but I did and wish I had done 3 with and just one without. Hi. Thanks for posting this. 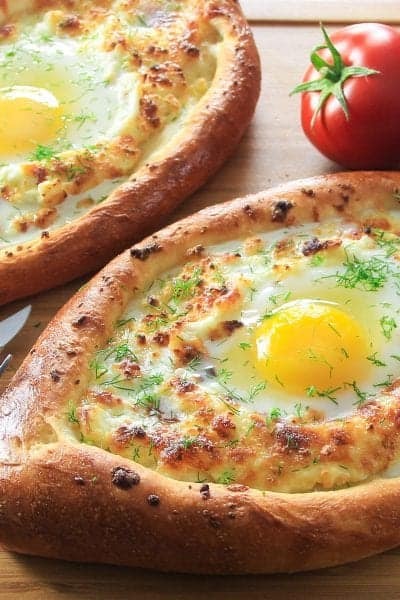 “acharuli khachapuri” is delicious. Could I put one correction. In Georgia we do not cut this. It’s a big no no. Egg should be very runny. Butter goes at the end after oven. You mix all around (cheese , runny egg and butter ) break peace from side and just dip!… the taste you get is totally different. At the end button will be left and if you still have space in stomach – you roll it up and eat. Thank you for the tips Mari! Really thanks for the recipe, but I have a Questions?. Do I have to put the Yolk egg without boiling on top of a cheese? Hi Ramy, I bake the cheese filled bread boats for 15 minutes, then I add the egg yolk and bake for an additional few minutes. You can flavor khachapuri with whatever you want 🙂 It’s all personal preference. What do you recommend as a suitable substitute for the feta? No bluey cheeses here! Do you need a harder cheese with the mozz & farmers? We love ricotta & cream cheese but I’m afraid it will change the texture. Hi Dina, there really isn’t any substitute for feta cheese. Your best bet would be to use ricotta cheese and add a little extra salt to make up for the missing saltiness of feta. Unfortunately, the texture may be a little different. I hope that helps answer your question Dina. Used halloumi cheese instead of farmer’s cheese. Gave it that salty flavor that goes so well with the egg. I felt right back in Georgia after eating two of those <3 Recipe on point otherwise! Thank you for your kind review! Glad this recipe was a winner for you! Where can you get farmer’s cheese? Thank you for this recipe. I subbed in freshly milled red fife for some of the all purpose flour. The final dough was rather wet but it still turned out absolutely perfect. I have seen a few variations with different cheeses but I really enjoyed the ones you chose. Excellent recipe. We had this bread in a Georgian restaurant in Toronto Canada and was determined to make it,. Made it from your recipe and turned out so tasty and my company finished all, it was great. Thank you Andy for those kind words! So glad this one was a hit for you and your company. Going to try making this today! Very excited to see how it turns out. You had the easiest instructions to follow so thank you! Hey Marie, it really depends on how strong your mixer is. Typically it takes a few minutes for the dough to take shape. What did you use to garnish? Hello Avery, I used freshly chopped dill to garnish the khachapuri. After I came across a post on instagram about khachapuri I was so excited to try it out – and I’m so glad I came across your recipe ! My khachapuri turned out beautifully (even though I’m just a first timer !). Thank you so so much ! 💕 I can’t wait to bake it again ! Laura I’m so glad to here your khachapuri turned out well! Thank you for leaving such awesome feedback!